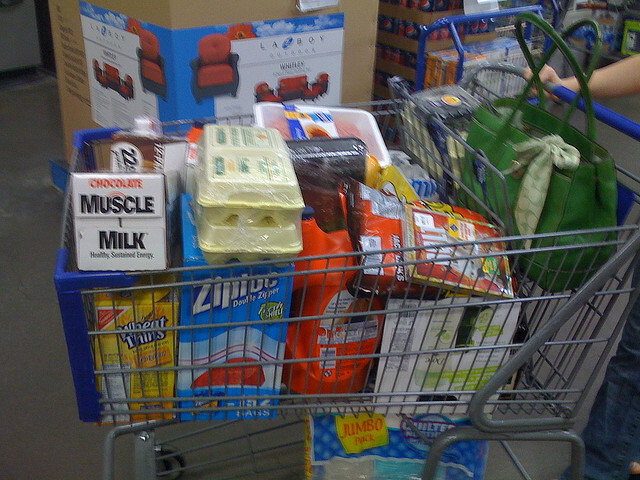 Home The Recessionista	Save Money On Groceries: Go… Smaller? It sounds like this kinda sorta negates my suggestion from earlier to Buy It In Bulk!, but this is serious business. We’re not only talking about saving pennies, we’re talking about saving calories. Whenever we go grocery shopping, we’re always looking for the best deals. And if you hit up places like [insert wholesale store], [insert wholesale store] and [insert store notorious for having awesome deals on huge products] then you’re likely to find yourself with the giant box of popcorn, the huge jar of tomato sauce or the massive thing of mayonnaise somewhere in your house. “We’ve done dozens of similar studies with dozens of different foods. With spaghetti, for instance, we found that the people who were given the large package of pasta, sauce and meat typically prepared 23% more – around 150 extra calories – than those given the medium packages. Did they eat it all? Yes. We find over and over that if people serve themselves, they tend to eat most – 92 percent – of what they serve. For many of the breakfast, lunch and dinner foods we have studies, the result is about the same – people eat 20-25 percent more on average from the larger packages. For snack foods, it’s even worse. On another occasion, we asked 40 adults at a PTA meeting to watch a videotape and provide some feedback about it. As a thank you, they were each given a bag of M&M’s – either a half-pound bag or a one-pound bag – to enjoy while they watched the tape. In reality, we didn’t really care what they thought about the tape, we only cared how many M&M’s they ate while watching it. After they finished the video, we weighed the remains in their M&M’s bag. The results were dramatic. Those who were given a half-pound bag ate an average of 71 M&M’s. Those who were given the one-pound bag ate an average of 137 M&M’s, almost twice as many – 264 calories more. Sure, a person saves some money by buying the big bag, but if he decides to watch a hundred videos in the next year, it will also cost him nine pounds of extra weight. The bottom line: We all consume more from big packages, whatever the product. Give people a large bag of dog food, they pour more. Give them a large bottle of liquid plant food, they pour more. Give them a large shampoo bottle or container or laundry detergent, they pour more. In fact, with the 47 products we’ve examined, the bigger the package, the more they use. Why do we automatically eat (or pour) more from big packages? Because big packages (like big portions) suggest a consumption norm – what is appropriate or normal to use or eat. As all of our studies suggest, we can eat about 20 percent more or 20 percent less without really being aware of it. Because of this, we look for cues and signals that tell us how much to eat. One of these signals is the size of the package. When we bring a big package into our kitchen, we think it’s typical, normal and appropriate to mix and to serve more than if the package were smaller. Although we may not finish the two-pound box of spaghetti when we make dinner for two, it makes us think it’s normal to take a few more bites than we would if it were a one-pound box. It bumps up our consumption norms and leads us to bump up how much we serve ourselves. Sometimes we think that because we see that price-per-ounce is smaller on the larger product, that we’re getting a better deal. And let’s be honest – in some cases, we are. That’s why I wrote about buying my beans, rices, spices and other staples in bulk. But those things that we think are big deals – the 25-pk of processed cookies/chips or the giant bottle of ketchup? Maybe not so much. I think this is why shopping weekly with a pre-planned menu for your household has such a benefit to it. You know which condiments you’re going to need. You already know which “snacks” you’re going to want. You’re spending less each time you go to the grocery store, you’re buying only what you need, you’re making sure you moderate your portion sizes (because you’re taking portions out of smaller containers) and that means you’re taking that much more control over your intake. That’s a big deal. To me, this is just another tiny tip to keep in mind when we shop. Stick to the staples when it comes to buying in bulk (or, if you are struggling with the staples, split them up into servings in little containers in advance) and leave the monster containers by the wayside. Your body just might thank you for it! I have started to buy less even though it means passing up on some “bargains” simply because I was tired of seeing so much of my food go to waste. Seriously. Cleaning out a fridge and finding bags of rotting grapes and onions that are starting to take root hurt my wallet and turned my stomach. This is a particular struggle for me, I have to keep out of the store or else I will buy the snacky, junk food, or stuff that is not on the program. With regard to bulk thing, I try to separate everything into portion sizes before I put it away. I freeze my chicken breasts individually, so I am not tempted to make more than I need. wow, this was fascinating! i had heard about the “big package = more consumption” before, in particular the movie theater popcorn example. but i never applied it to the size of packages i buy and the food that i prepare at home. now that i’m thinking about it, i am shocked at how true it is, and how unaware i have been! so glad to have discovered your blog- you’ve got another subscriber! Our eyes are always bigger than our stomaches, so I can see why the subjects ate more when given a bigger bag. Even though we’re a family of 5, I don’t like warehouses because I notice we eat more of the pre packed junk (longer shelf life & usually unhealthy) and the bulk veggies spoil quickly (a waste of money). I agree with going to the store with a set menu and I save more money this way. Also, I can’t stand a cluttered refrigerator because there’s more of a chance of stuff going bad (wasting money) because I couldn’t see it. It has taken me 40 years! to come to this conclusion. I buy medium or small packages because I am alone now and I don’t need to have a lot of food in my house. I go to the store once a week with a list and that’s it so if I forget something, I have to make do without it. I no longer have shelves of “extra” food and my fridge looks empty many days and I’m finally happy with that. I was always afraid that I wouldn’t have enough food to satisfy myself. Duh!!! I’d never have thought about it, but it’s pretty obvious really. See more = eat more. Great post! I’ve never thought about this before. Time to implement a few changes. I don’t buy any food item in bulk. I get too bored with foods too quickly to do that. I shop at the big Farmer’s Market every 3 weeks. When I get home I divide up my seafood and other meats into bags, date it, and freeze it. I also flash freeze some of my veggies. The only thing I have to go to the regular supermarket for is more fresh fruit if needed and a few things that I might not find at the farmer’s market. I no longer look at sunday sale papers and if I need a coupon for something, I can usually just go online and look for one as opposed to buying something just because I have a coupon. You know… I’ve found that getting the larger package on some things is a waste of money for me. I don’t use it all. For example, I can get a gallon of milk on sale for $2.00 or a half gallon at regular price for $2.99. Well my first thought is $2 is better! I’m not going to drink even HALF of that gallon, and generally end up throwing out 3/4 of it. What a waste! I now go for the half gallon and as it nears its expiration, it’s easier to convince myself to finish off what’s left vs. trying to convince myself to finish off the rest of a gallon. This Post hit home for me. I was buying in bulk because it saves time and money,so I thought…just cleaned out my fridge and had to toss way to much food. Our eyes are truly bigger then our stomach and whatever we “caught ” on Sale was in Vain if we are trashing more food then we eat.SMH…I got a new attitude about shopping and what and how much I am really going to cook in a week.